Steelers Nation met the news of Martavis Bryant’s pending season-long suspension with a mix of angry, grief and concern. All of these reactions are understandable. Martavis Byrant is caught in a dangerous downward spiral of drugs and depression. The primary concern now must be to find a way to help this father of two children to cope with his demons. And that was the focus of Steel Curtain Rising’s first piece. Those interested on more should see USA Today’s Steelers Wire’s piece by Jon Ledyard, which is absolutely must-read. Today however, we shift our focus from the human element to the story, to the cold hard impact that Martavis Bryant’s suspension will have on the Steelers in 2016. Does Bryant’s Suspension Shorten the Super Bowl Window? Will Bryant Play Again in Pittsburgh? A more cynical reaction to the suspension of Martavis Bryant could easily be, “Does it really matter?” After all, the Steelers offense is loaded with weapons, and was explosive in 2015 despite starting 3 quarterbacks and missing key players to injury. 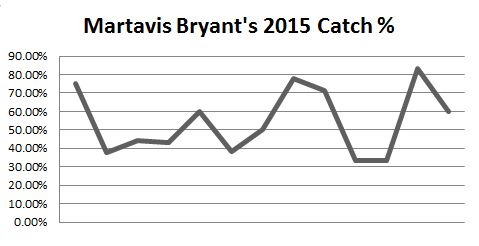 Then there’s the question of how much impact Bryant had in 2015. Bryant missed the first four games due to a suspension and the next one because of a minor injury. Bryant returned with a bang vs. Arizona and closed with phenomenal efforts in both playoff contests. But how did Bryant do in between? As you can see, in between, Martavis Bryant was widely inconsistent. In six of the 11 regular season games he played, his catches to targets ratio was below 50%. On four occasions it was in the 30’s. But Bryant was noticeably bad vs. Baltimore (ok, who wasn’t? ), and he had to be pulled the following week vs. Cleveland. But one must resist the temptation to come down hard on Bryant. Bryant played lights out in the Steelers December wins vs. the Broncos and the Bengals and he maintained that standard in the playoffs in January. Stepping up in the post season is nothing to take for granted. Moreover, when all was said and done, Bryant caught 54% of the passes that were thrown his way, which is on par for the rest of the Steelers receiving corps. You can try to cook these numbers anyway you like, but replacing a player of Martavis Bryant’s caliber, even when you control for his inconsistency is no easy task. This was going to be the year this group put it all together and made perhaps one final Super Bowl run before things start breaking up and we settle into our next version of the 1980s. Perhaps the window isn’t that dramatic. But perhaps it is. And Bryant, to use the great Reggie Jackson line, is the straw that stirs the drink. There’s lot of logic to support Wexell’s hypothesis. People forget, but the Steelers offense began the 2014 season as a sputtering dude and didn’t begin to jell until Martavis Bryant joined the line up. While Steelers offense played well without Bryant in early 2015, Bryant has more touchdowns in his first 16 games than any player in Steelers history, and he’s the only Pittsburgh Steeler to post 194 yards from scrimmage in the playoffs. Let that later number sink in for moment. Martavis Bryant holds the Steelers post-season single game yards from scrimmage record, meaning he accomplished something that neither Hall of Famers Franco Harris, nor Lynn Swann, nor John Stallworth, nor Jerome Bettis could do. Even if Miller was “catch and tackle” type player in 2016, throwing in Miller’s direction was a pretty damm sure bet. That type of consistency, paired with the loss of Bryant’s big play talent could easily conspire to shorten or even scuttle the Steelers Super Bowl window. One thing is certain. Keithy Butler did better than expected in his first season as defensive coordinator. He’d better find a way to continue the improvements in 2016. As goes Sammie Coates, so goes Darrius Heyward-Bey… What’s that you say? The Steelers surprised a lot of people during the 2015 NFL Draft when they took wide receiver Sammie Coates in the 3rd round. This off season the Steelers resigned Darrius Heyward-Bey, which in and of itself was no surprise, but his 3 year contract perhaps was. Martavis Bryant’s suspension removes the mystery behind both moves. Almost as soon as word of his first suspension leaked, the Steelers let it leak that they knew of the issue, and drafted Coates accordingly. Word has also leaked that Heyward-Bey’s contract is so long precisely because the team was concerned about Bryant’s future availability. The decision to sign Ladarius Green follows suit. Ladarius Green is not the Steelers “prototypical” tight end. He’s not much of a blocker and more of a vertical threat than, well any Steelers tight end in history. While Green has much to prove yet, on paper give the Steelers the type of weapon to compensate for the loss suffered from Bryant’s absence. Mike Tomlin and Kevin Colbert rarely make personnel decision out of fear, but they almost always make prudent ones. The Steelers have not commented on this latest situation, given that nothing is official yet. Early word, reported by Jeremy Fowler of ESPN as well as others, is that the Steelers do not plan to cut Martavis Bryant. The Steelers history with player who’ve had substance abuse problems is mixed. In general, attitudes towards addiction are less punitive today than they were in earlier generations. The fact that Bryant didn’t fail a test but simply missed two, while passing drug tests for life insurance, might not mitigate things in the eyes of the NFL, but it could for the Steelers, as Bryant is also said to be battling depression. Assuming Bryant stays clean between now and 2017, the Steelers will probably give him a third chance, but there’s a lot that needs to happen, or not happen, between now and then. This entry was posted in Steelers 2016 off season and tagged Antonio Brown, Ben Roethlisberger, Darrius Heyward-Bey, Franco Harris, Heath Miller, Jerome Bettis, John Stallworth, Keith Butler, Kevin Colbert, Le'Veon Bell, Lynn Swann, Martavis Bryant, Pittsburgh Steelers, Sammie Coates. Bookmark the permalink.